An excellent example of historical docudrama, completely different from The Favourite. 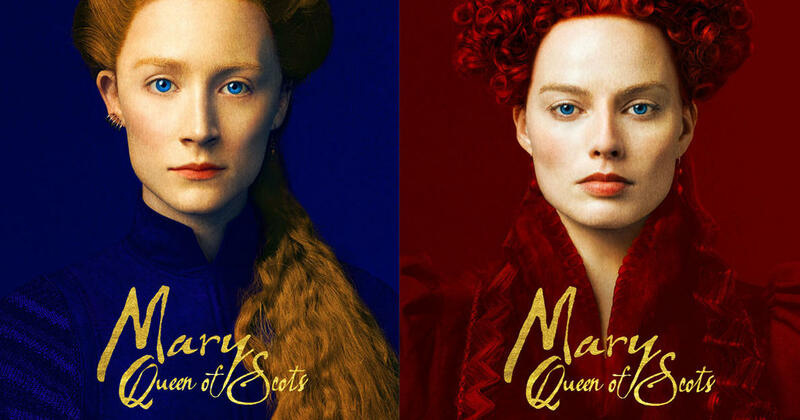 If you like costume dramas but abhor their sometime surface charms, watch Mary Queen of Scots, a down and dirty and brilliant costumer about 16th-century’s Queen Mary Stuart’s (Saoirse Ronan) rise and fall. Cousin to Queen Elizabeth (Margot Robbie), the two have an uneasy alliance against men who want to depose them and the times that wish to marginalize them but can’t. If for only helping to clarify the succession, from Henry VIII to James, the first king of England and Scotland, this docudrama is worth seeing. Of course, history is not the main reason to spend 2 hours mucking around gloomy castles. It’s the people! Besides the superb portrayals of the two queens by Ronan and Robbie, a barrage of authentic looking and acting Earls and Knights gossip and plot enough to challenge the audience about allegiances. The severity of arch-conservative Scottish Catholics is no more likely to advance the cause of the Church in the eyes of the audience than contemporary pedophilic priests. In other words, the audience is immersed in the workings of English and Scottish monarchies and religion to a degree rarely seen on the screen. Because of this authenticity, the audience cares about the players while it gets a first-rate history lesson. When Mary gets her head chopped off, she keeps her dignity and the audience, mindful of Marie Antoinette’s end, is saddened but accepting of monarchs’ cruel fates, then and now. “In my end is my beginning,” she embroidered on her estate cloth, perhaps sensing well that her son, James, would one day rule. Tough lady, great mother, exemplary acting.